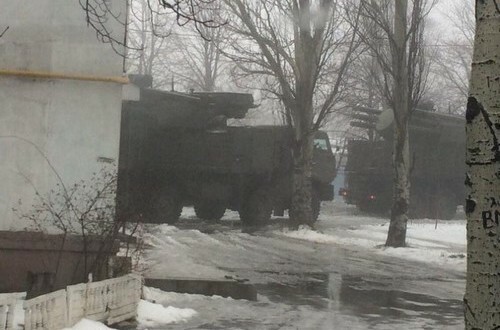 A recent report, allegedly from Shakhtersk city, within Ukraine’s Donetsk region, shows pictures of a Russian-designed 96K6 Pantsir-S1 (Панцирь; ‘Cuirass’) air defence system (NATO reporting name: SA-22 Greyhound). Designed by KBP Instrument Design Bureau, the Pantsir-S1 entered service with Russian forces in 2010, and is only known to have been exported in limited quantities, primarily to the middle-east. 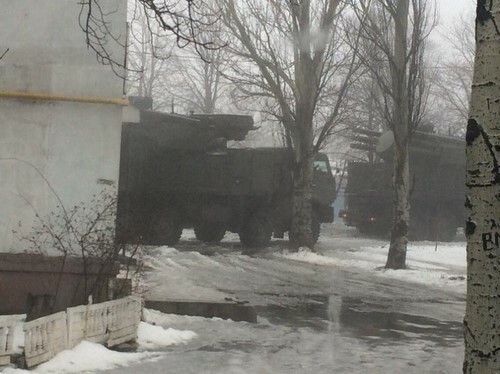 The Pantsir-S1 system, allegedly photographed in Shakhtersk city. Typically based on an 8 x 8 truck chassis, the Pantsir-S1 is armed with two twin-barrel 2A38M 30mm automatic anti-aircraft guns and twelve 57E6 (or 57E6-E) two-stage solid fuel surface-to-air missiles arranged in two six-tube groups. Integral acquisition and tracking radars allow its 3 person crew to detect targets with a radar cross section (RCS) of 2 square metres at a range of up to 36 kilometres, under ideal conditions. The 72.5 kilogram 57E6 missiles have a maximum range of 20 kilometres and maximum altitude of 15 kilometres, containing a 20 kg continuous-rod warhead with 5 kg of explosive compound, intended to produce approximately 700 2.8 gram and 2,260 0.9 gram fragments. Its first stage booster allows the missile to reach a velocity of 1220 m/s in just 1.5 seconds, with an overall velocity of 700 m/s at 18 km range. The 57E6-E (export variant) missile employ a longer booster burn duration, raising peak velocity to 1300 m/s. A damaged 95Ya6 booster, found in Ukraine last year. 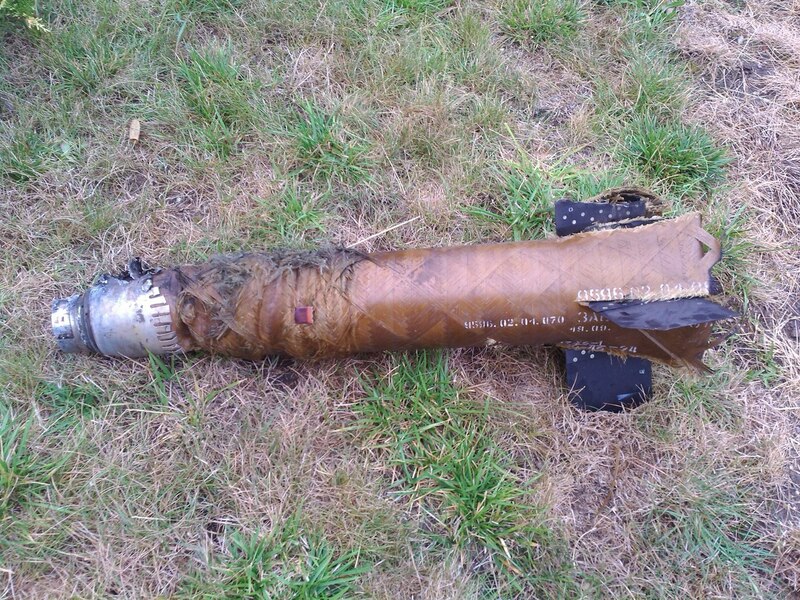 Remnants of a 95Ya6 booster, the first stage of the 57E6 missile, were previously documented in November of 2014 in ARES Research Report No.3: ‘Raising Red Flags’, which examines arms and munitions documented in the Ukrainian conflict. At the time of the report’s publication there had been no confirmed sightings of the Pantsir-S1 system. 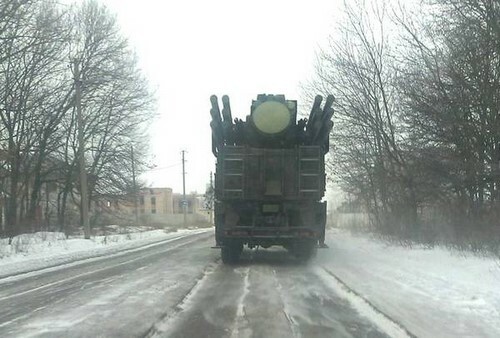 In mid-December images posted to a Russian social network appeared to show Russian Pantsir-S1 systems devoid of markings or license plates in the Kamensk-Shahtisnsk district of Russia, near the Ukrainian border. The images from last week mark the first photographic evidence of these systems within Ukraine. Technical specifications taken from the KBP Instrument Design Bureau website. Additional specifications and information taken from this technical report. Special thanks to N.R Jenzen-Jones and Jonathan Ferguson. A video brought to our attention shows a Pantsir-S1 being driven down a highway in Lugansk, Ukraine, a little over a week ago. The location was verified through comparison of landmarks using Yandex maps. With thanks to Jan Jansen. This is a defensive rather than offensive weapons !!! OO, how are you fed up with your fakes. In Donetsk and Lugansk Republic is not included Russian military equipment! And actually, I would like to help them. Seems very strange that ukrainians didn’t show millions of Russian soldiers and thousands of tanks! The task of this research is to pinpoint that Russia is supplying weapons that are available ONLY in Russia. Soviet-union made tanks which are in operation both in Ukraine and Russia is not interesting part for research.